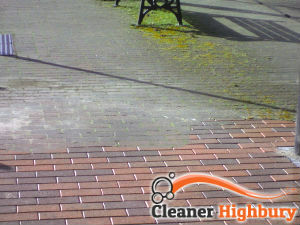 Only professional jet washing services of external home and business areas could guarantee excellent results and high-quality service. Currently, we are one of the best professional cleaning services providers not only in Highbury, N5, but in London, too, with a lot of regular customers and great reputation. The great level of trust towards our brand originates from the fact that we have always taken excellent care of our customers’ needs and preferences, working in line with their demands and implementing the most modern machines and technologies at the cleaning process. In addition, we also work with the best detergents and cleaning products that are available on the market in order to reach the best results for our clients. Make their best to remove not only dirt and grime, but also moss, mould, tyre marks, etc. Take care of all tile, wooden and concrete surfaces, as well as of the paved driveways and pathways, swimming pools, etc. As already explained above, our company has always made sure our customers are well taken care of. 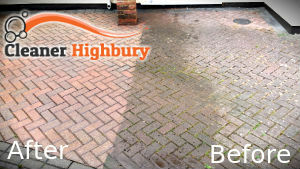 We do not only meet the highest standards in the business, but we also work in correspondence with our customers’ personal demands in order to bring the latter maximum satisfaction with our jet washing services. This is exactly why we could also apply special sealants or non-slippery coatings to some external surfaces upon request to guarantee that our clients with get nothing but the best procedures in return to their money. We can also promise that we will make sure all your outdoor areas will be left in absolutely spotless and impeccable condition. You can reach us 24/7 in Highbury as we work on both weekdays, weekends and Bank holidays. Call us now or contact our customer service representatives via e-mail. Copyright © 2015-2019 Cleaning Services Highbury. All Rights Reserved.